With some of Northern Europe’s most beautiful and romantic castles scattered throughout Copenhagen and its surrounds, castle addicts are sure to adore the Danish capital. Here’s how to experience some of Copenhagen’s castles, either on a city walking tour or as part of a castles tour outside of the city. Home to the oldest royal family in the world, Amalienborg Palace is also known for its beautiful palace square and its royal guard, the Den Kongelige Livgarde. Experience the Changing of the Guard daily as they march from their barracks at Rosenborg Castle through the streets of Copenhagen to Amalienborg Palace. Tour the palace museum to get a glimpse into the life of the royal family. The Dutch Renaissance–style Rosenborg Castle, originally built as a country summerhouse in 1606, is a prime example of King Christian IV’s many architectural projects. 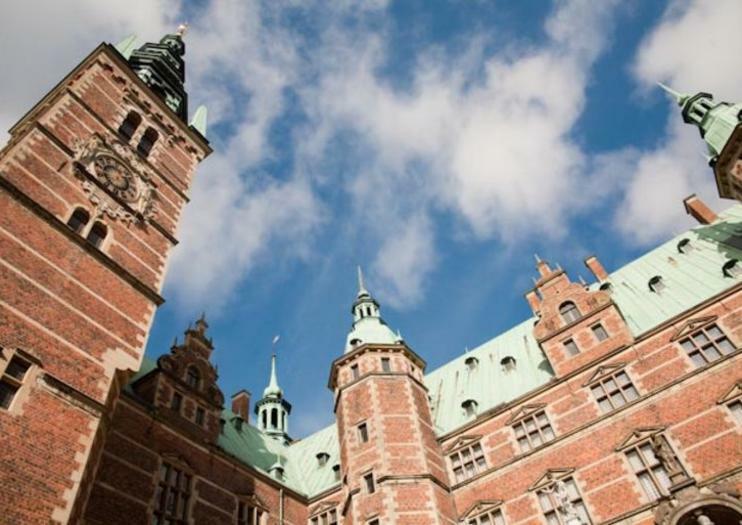 Today visitors can learn about Danish history and culture while touring the castle and the impressive possessions—including the dazzling Crown Jewels—of the king and his descendants. The castle garden is the oldest and most visited park in Copenhagen. Originally a hunting seat for King Frederik IV in the early 18th century, this palace—set in a beautiful park bordering Esrum Lake—is often the setting for the royal family’s important life events. The queen also receives visiting heads of state at Fredensborg. Built by King Christian IV in the 1600s, this magnificent Renaissance-style castle just north of Copenhagen is now a national historical museum, holding treasures of painting, tapestry, porcelain, silver, and furniture. Head north through the Danish countryside and you’ll reach Kronborg Castle, a magnificent Renaissance castle and UNESCO World Heritage Site. Made famous as the setting of Shakespeare’s Hamlet, the castle sits at the head of Oresund Sound near the town of Helsingor and hosts a Shakespeare Festival each summer. Copenhagen is famous for its picturesque cobblestone streets, historic castles, and 17th-century architecture. While driving can be difficult in Denmark’s capital, this private walking tour allows you to bypass traffic, explore Copenhagen’s most popular districts, and see the city’s famous castles, squares, and gardens—all with the full attention of your guide and no unknown guests. See the best of Copenhagen on this 3.5-hour private walking tour. As you explore, hear historical tales and facts about Denmark’s capital, and admire sights including the Little Mermaid and Amalienborg Palace. Absorb the maritime air and lively atmosphere, and discover other must-sees including the Tivoli Gardens and Nyhavn. As a private tour, the itinerary can be tailored around you. Hotel pickup is included, while cruise port pickup and drop-off is an additional cost.